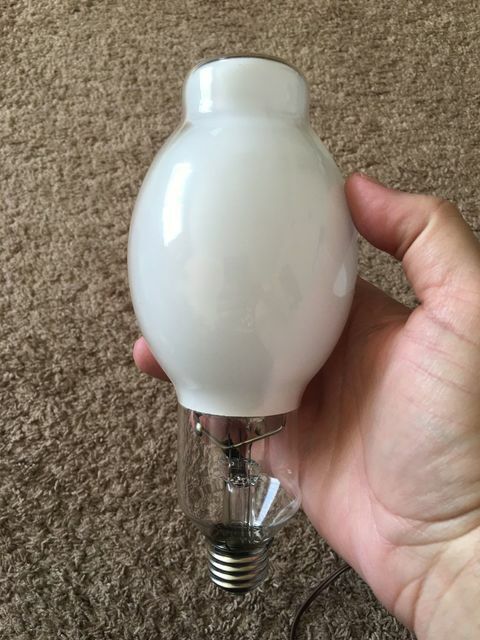 Lighting-Gallery-net - good ol' mercury vapor/GE 250w EZ-Merc SBMV possibly made by Panasonic? They're NOT EYE. GE 250w EZ-Merc SBMV possibly made by Panasonic? They're NOT EYE. Unusual lamps in BT28 and medium bases. They're quite different from those made by EYE in many ways. Like the glass forming at the base, looks more like a Philips. The stem press is clear, not black, which older EYEs had. The etch is outside stamped, older EYEs were inside stamped. I think EYE did make some in BT though? Most were E28 though. Interesting, we never had BT-shaped bulbs over here, only ever PS originally and then elliptical. Well don't you have BT lamps from Japan and on rare occasions, the USA? Not on general sale, at least not as far as I've seen. Obviously us collectors have them, but I don't recall ever seeing them in normal commercial use anywhere.